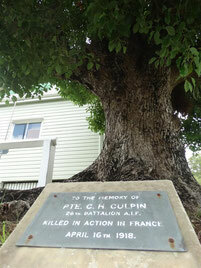 Culpin was a well established farmer in Eumundi growing pineapples and prominent in the local community. Clarence Culpin was in a group of 9 who enlisted together. At the Eumundi School of Arts hall a dance was held for them. People made patriotic speeches and the chairman of the Maroochy local recruiting committee was there and they fare welled the men in style. Of the 9 men three did not return. 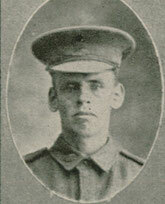 Culpin embarked on board the HMAT A36 Boonah on 21 October 1916 at the age of 36 which was considered quite old - the average age being lows 20's. He spent much of the war plagued by various illnesses including mumps, boils, abscesses, cellulitis. He was killed in action while fighting at Buire Somme Sector France and was buried at Dernancourt Communal Cemetery France. A tree planting ceremony was later held with a tree for Culpin planted at the front to the School of Arts hall, the very place where he had been fare welled.